Located in central Sydney’s Bathurst St, WEA Sydney has contributed to the city’s cultural and intellectual life for 100 years. In 2013, WEA Sydney celebrates its centenary with an autumn term over-brimming with intriguing and rarely offered programs. Autumn Centenary activities include commemorating 100 Years of Travel Photography with anthropologist Perry Celestino on 7 June; music tutor Robert Forgacs’ talk on 10 May to celebrate 100 years since Wagner’s birth; you can cross the Blue Mountains cheaply with Peter Moore, marking the first crossing in 1813; and Peter also presents a free talk to celebrate James Joyce, Ulysses; and Bloomsday, on 16 June. Most importantly, WEA Sydney is putting on four free vivid Culture Days, to celebrate the national holidays of Italy (1 June, Republica Day), the USA (4 July, Independence Day), France (14 July, Bastille Day) and Spain (25 July Galicia Day). WEA Sydney art tutor Cilla Campbell is also presenting an exhibition of students’ work at the Incinerator Art Space in Willoughby from 29 May to 9 June 2013. 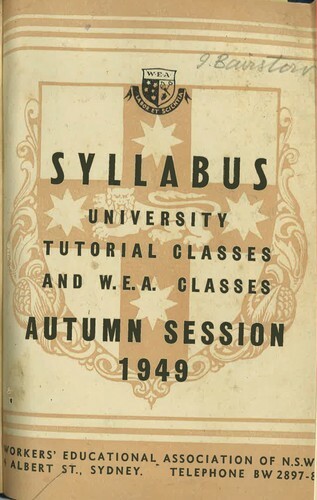 The roll call of previous students is impressive: Australian Prime Minister Ben Chifley received his economic training at WEA, Margaret Whitlam learnt Greek and Italian and the late author (and former Bondi butcher) Robert G Barrett kick-started his writing career after enrolling in a WEA course and went on to sell more than a million copies of his books. “The standard of the teaching at WEA is very good and what I like about the courses is the participation with a group of other like-minded people. We have become a small community. The course is more than a just a learning experience. We all share our stories.” Elizabeth Evett AC, first Chief Judge of the Family Court of Australia. For course catalogue, visit the website above.